Mexican Emoji Clearly Becoming More ‘Radicalized’ Indian emoji suspected to be Mexican emoji, but with a turban. 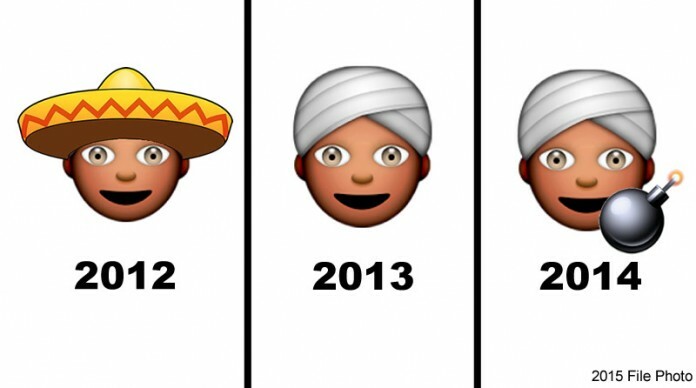 Authorities have good reason to believe Juan E. Mojica has become radicalized and obtained a turban and an arsenal of emoji weapons. Columbus, OH – Mexican emoji, Juan E Mojica has been detained by authorities based on credible evidence provided by an unidentified agency informant. Local and federal law enforcement divisions monitored Mojica over the past three years, and have also intercepted text messages carrying some variant of his likeness. Mojica, who has renamed himself Al-Makseekee Ma’a Amama’a (which means Mexican with turban), is suspected of ‘radicalization through appearance’ and will be charged for his recent acquisition of explosives and other iconic weapons. Police believe Mojica obtained the explosives by swiping through to the fourth page under the bell icon of emojis. Mojica, who has a history of criminal misconduct, was also arrested in 2010, when he was caught trying to solicit two dancing twin emojis during an undercover prostitution sting. “We can speak with a high degree of certainty that the suspect Mojica is the same radicalized individual we’ve seen pop up in other messaging symbols as of recent,” said FBI Senior Intelligence Director, Henry Jacobson. The agency used facial recognition software to confirm Mojica’s identity before and after his conversion. Mojica and his attorney were unavailable for comment. A formal indictment is expected to take place on Wednesday.